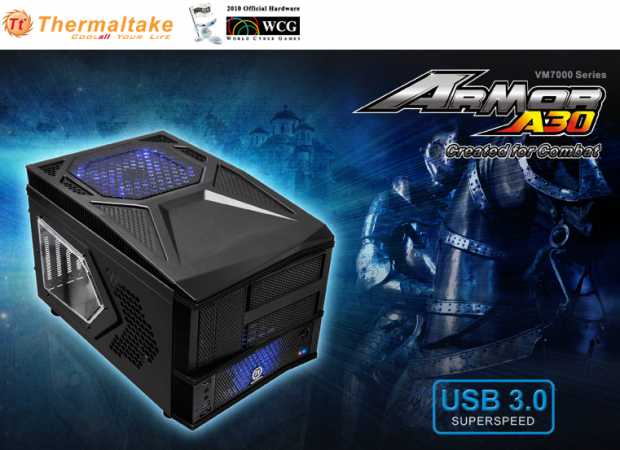 Thermaltake, leading DIY chassis brand, is launching their latest edition to the popular and award winning ARMOR series of PC cases. The entirely black ARMOR A30 sports the familiar “bulletproof” armor design concept with metal mesh elements lending the ARMOR series an extremely stylish and powerful appearance that attracts gamers and enthusiasts alike. The top and front blue LED-fans enhance the overall combat ambience. It’s small dimensions of 266 (H) x 291 (W) X 456 (D) cm make it an ideal solution for small form factor systems (Micro ATX and mini ITX), while still allowing for enough room to house the most powerful graphics cards available on the market today (e.g. AMD Radeon HD 5970 and NVIDIA GTX460). Demanding LAN party goers can now set up a truly powerful gaming machine that is still small enough to be portable and stylish at the same time. Optimized multimedia connectivity is provided for by one USB 3.0 SuperSpeed, one USB 2.0 and one eSATA connector as well as HD Audio, all integrated in the left front panel for easiest access. Safely located on the right front panel are the power button and the recessed reset button. This way all important function keys and connectors are quickly reachable right from your seat and you don’t need to mess around at the back of your case. Furthermore, a special lock mechanism for your mouse and keyboard ensures that you'll always stay in arms and competitors at LAN parties won’t take them away. As characteristic for Thermaltake chassis, special attention had been paid to optimized ventilation and airflow. Therefore one 23 cm blue exhaust LED-fan on top and one 9 cm intake blue LED-fan in the front have already been pre-installed and increase the combat spirit with light-effects. Two more 6 cm fans in the back additional increase overall air circulation. A specially developed modular structure offers a most convenient way to assemble a highly upgradeable system on the smallest amount of space with a motherboard footprint of 9.6” x 9.6”, equaling Micro ATX/ mini ITX motherboards. Overall the ARMOR A30 offers enough room for 2 x 5.25” and 1 x 3.5” accessible devices, as well as 2 x 3.5” and 2 x 2.5” hidden devices. With 4 expansion slots in the rear, users are assured to stay future proof for possible upcoming system expansions.